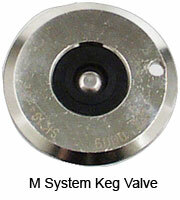 "M" system recently introduced to the U.S. market. Body is the same as the German Slider, but the probe configuration is unique. It is used by breweries such as Schneider, Aventinus, and Einbecker. The "M" system should not be confused with the "A" system German slider that is used by the majority of German breweries.